Welcome to the part-two of our interview with Cassidy Zachary and Tracy Jenkins, curators of the exhibition Youthquake! 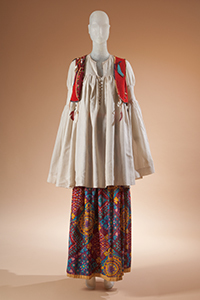 The 1960s Fashion Revolution , open now through April 7 at the Museum at FIT. check out part one here. Keren Ben Horin: Can you talk a bit about the design of the exhibition? 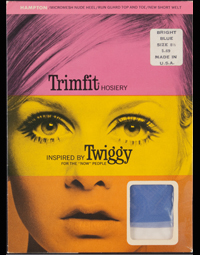 Tracy Jenkins: The color scheme was based on a package of a Twiggy trimfit tights, which are in the exhibition, and also a Bridget Riley painting of the time. We have blocks of color coming in from different directions; in the first section we have boutiques and we have a block of color coming up, so we were sort of thinking about influence coming up from the street, and at the high fashion section of course it’s coming from the top down. In the mannequins section the backdrop to the Hippies is a yellow circle which could be the rising or the setting sun, but they are very abstract, they have rounded corners, they sort of allude to the molded plastic furniture of the time, they are very bright and very intense colors. The platforms are metallic silver to allude to the space age, and to reference the look of the time but not to be too literal. Cassidy Zachary: And we also have large quotes on the walls which was really a fun element to liven up the space. KBH: Now let’s talk about music, it was very important to both the Hippies and the Mods. CZ: Music was, of course, an inseparable element of both the Mod and Hippie subcultures, so it plays a really important role in the youthquake fashion revolution. rock ‘n’ roll music is also transforming the traditional fashion show, so where models really used to walk in a uniformed procession down the runway, they are now dancing to -sometimes live- rock ‘n’ roll bands. It’s a very exciting, energized time. Of course musicians are essential in spreading these looks to their fans. A literal manifestation of that relationship is the fantastic Bob Dylan “poster dress” that is in the exhibition. It’s from a graphic artist Harry Gordon’s “Poster” dress collection that premiered in the US in 1968. At that point, paper dresses had been a fad for a couple of years- Gordon wanted to exploit the fact that you were wearing paper and used this geometric flat shift as a canvas for his art. He had bold graphic images such as Bob Dylan, but also a blown up Allen Ginsberg poem, a cat, and an eye. 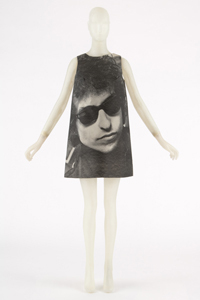 Dress with photograph of Bob Dylan by Harry Gordon, paper, black ink, 1968, England, gift of Estelle Ellis. The Museum at FIT. 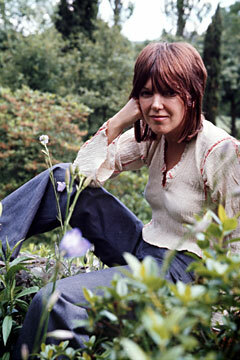 TJ: This is also a time where you had people working simultaneously in several genres, so someone like Françoise Hardy who was a French pop star, was also a model. She is featured in the pages of Vogue, and really they are not heralding her as a musician, they are showing her wearing everything from a $8 micro mini skirt to a Courrèges and Paco Rabanne, which she was known to wear in her real life. You also have someone like Jimi Hendrix who is traveling between London and the West Coast and popularizing the psychedelic style of the so called “jet-set” Hippies, and also people like Mick and Bianca Jagger who are young and fashionable, and have money to spend. In the latter part of the 60s they bring in these really opulent flowing garments that are influenced by non-western cultures. Françoise Hardy. American Vogue January 15, 1967. 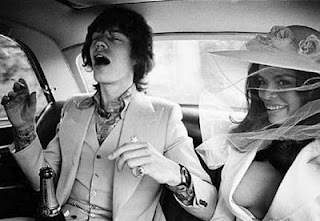 Mick and Bianca Jagger on their wedding day, 1971. Bianca is wearing an Yves Saint Laurent suit. KBH: You bring me to a great point, the decade started with a linear, modern style, but as we approach the 1970s we see a completely different style, even the fashionable body has changed in the course of that decade. TJ: Hippies are almost the antithesis of the Mods in terms of style, and the subculture of Hippies is anti-technology and anti-establishment, they want to return to traditions of hand-craftsmanship and natural materials, so they are using leather and cotton and these kinds of things, they want nothing to do with plastic or technology or the future. They are not participating in fashion, but of course they are very influential. Fashion almost immediately co-ops their style, a real Hippie would be wearing denim and a political t-shirt, and a Hippie style for a high fashion person would be someone like Giorgio Di Sant’angelo, who has very similar garments- printed cotton skirts, peasant blouses, leather vests- but these are extraordinarily expensive. The Giorgio Di Sant’angelo ensemble we have was worn by Marina Schiano, who was the vice president for Yves Saint Laurent beginning in 1971, so this is obviously a successful business woman now dressing in this fashion. Giorgio di Sant’Angelo, ensemble, cotton, suede, shell, feathers, 1968, USA, gift of Marina Schiano. The Museum at FIT. CZ: Prior to the youthquake the Parisian couture really set the pace of fashion, the style then trickled down to the masses at all price points. After the youthquake, you have young designers who are creating fashion at a level that more people can afford, and you see it trickle up from the street and influencing high fashion designers such as André Courrèges , Yves Saint Laurent, who himself is a very young at this time, and Pierre Cardin. TJ: Another huge change is that by the end of the 1960s many couturiers open ready-to-wear boutiques, which was not done prior to this. Couture doesn’t go away, and its influence is still felt, but there is no longer a single fashion authority or a single way to dress. I think the most revolutionary aspect of the 1960s is that you have now a big soup of all styles, by the end of the decade you can wear a mini skirt, you can wear a maxi skirt, if you are a man you can wear a skirt, if you are a woman you can wear pants, there are no more roles. 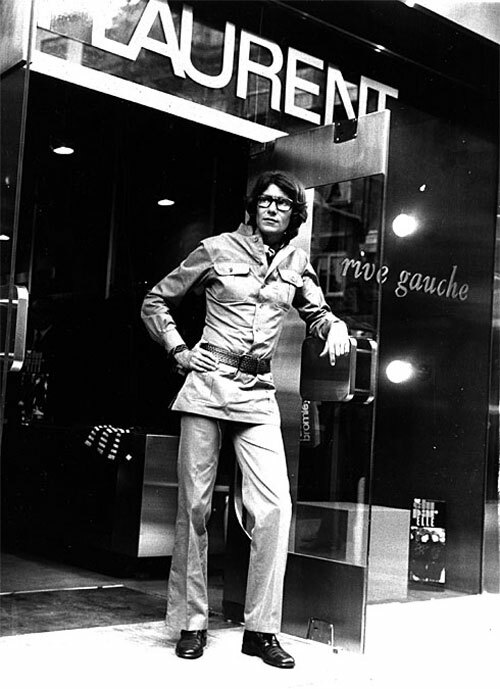 Yves Saint Laurent in front of his Rive Gauche RTW store, wearing Safari suit. 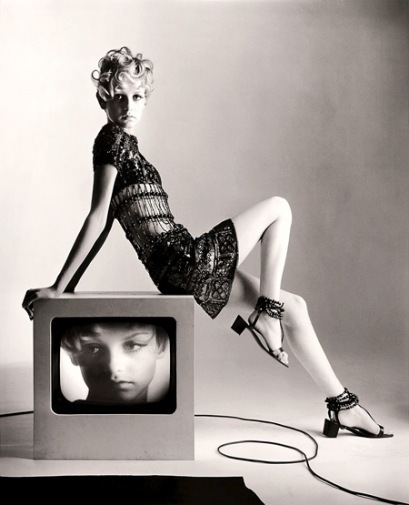 Twiggy in Yves Saint Laurent, Vogue, March 15, 1967, photographer:Bert Stern. CZ: The breakdown of rules of gender barriers, of time a day formality, all of these things that we take for granted today are a product of the 1960s youthquake revolution. TJ: Not only the styles, but also the way people can participate in fashion, so how it’s produced and consumed. You can be a young designer, you don’t have to work in a couture house for years and come out through the ranks, you can open a small shop, design a small line for a few of your friends and become world famous. KBH: It’s interesting that even the way fashion is delivered is now different. If prior to the 1960s, couture houses had intimate presentations to fashion editors and buyers, the ready-to-wear runway shows were open to everyone and often for free, it was a “democratic” way of showing fashion. It must have influenced how styles were interpreted for the mass market. TJ: Right, in Paris previously you had shows only two times a year, and now you can create smaller runs, you can really be more whimsical and experimental. TJ: It’s a time when everything was possible, and there’s such an energy and a spirit to these fashions. It was a time of revolutions, social revolutions, political revolutions, a whole host of events going on around the world that made people question the way everything was done, it was exciting time of possibility and initially of idealism that is really reflected in these styles. CZ: So many of the silhouettes today -miniskirts, pant suits, and of course we see this resurgent of a slim cut silhouette for men’s wear- were products of the 1960s, and I am not sure that many of these silhouettes ever truly went away. KBH: Thank you very much ladies, this has been a pleasure. TJ and CZ: You are welcome! This entry was posted in Exhibition, interviews and tagged 1960s fashion, Bert Stern, Bianca Jagger, Bob Dylan, Fashion Photography, Françoise Hardy, Giorgio di Sant'Angelo, Harry Gordon, Marina Schiano, Mary Quant, MFIT, Mick aJagger, paper dress, Twiggy, Vogue, Youthquake, Yves Saint Laurent. Bookmark the permalink.